Wadsworth also goes against modern custom by having his actors speak directly to the house. They rarely face each other during intimate discussions or heated disputes. They retain an almost rigid formality that is enhanced by the physical traits noted in the previous paragraph. Counterintuitive as Wadsworth’s methods are, the results are splendid.The McCarter production of “The Barber of Seville” maximizes every opportunity for comedy. As importantly, it shows the mettle of each character. Figaro and Count Almaviva may be as resourceful and as clever as we know them to be from the Rossini and Mozart operas based on Beaumarchais’s plays. Dr. Bartolo, especially as played with such reflexive cunning by a marvelous Derek Smith, is the revelation. Beaumarchais’s Bartolo is no fool or easy gull for the tricks Figaro devises to serve Almaviva and his desire to carry off Bartolo’s ward, Rosine, as his bride and countess. He is shrewd man who questions illogic, who can anticipate skullduggery, who can see through fraud and sleight of hand, and who is adept at planning and executing strategies of his own. Smith, as directed by Wadsworth, portrays Bartolo as a ready and worthy adversary of the archetypical heroes of the Figaro plays, the count and his factotum. His performance is an example of why Wadsworth’s approach to Enlightenment/Age of Reason theater works so well. The stylization enhances and magnifies the depth and humanity of each character. It calls attention to the intricate details of a character’s motives or actions and allows the character to transcend the literary or dramatic type assigned to him or her by 18th century convention to become a full and possibly sympathetic being instead of a theatrical cog that has a standard, expected function to fulfill. Bartolo is as much a foil and as much a man who has to be defeated for the “good” and favored characters to win the day, but Smith, via Wadsworth, endows him with canniness that precludes foolishness and emotion that earns him regard, making Bartolo much more than a comic villain or consummate loser. Wadsworth’s approach enriches “The Barber of Seville” by adding texture to the intrinsic sources of entertainment crafted by Beaumarchais. The characters of Rosine and Dr. Bazile benefit as well from an expansion of their roles from type to faceted human with minds, motives, and misapprehensions of their own. As with the series of Marivaux plays Wadsworth staged at McCarter in the last century, he illuminates “The Barber of Seville” by exposing its dramatic variety while retaining its comic delights. “The Barber of Seville” is welcome in any form and on any terms. Of the two dozen or so productions of I’ve seen of it, 90 percent in the form of Rossini’s opera, only one failed to at least amuse me. The plot is a standard one for 18th century…or 17th century comedy…or 16th century comedy… A young woman of beauty, accomplishment, and common sense lives in the home of a significantly older man, usually one of some standing such as a doctor, judge, noble, etc., as his ward. The codger falls in love with the ingénue, and often with the wealth she either harbors or is about to inherit, and plots a marriage. His plans are thwarted by the arrival of a handsome and equally influential swain who sees the woman from afar and falls instantly and obsessively in love with her. 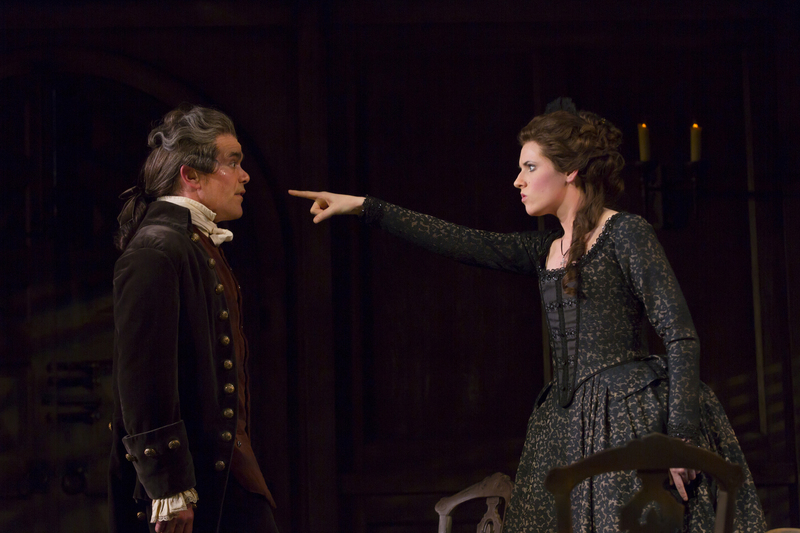 The woman, in turn, spots the swain, who is usually disguised in a way that will fool the codger and enchant the ingénue, and loses her heart to him. Often, the plots include a comic go-between who can further frustrate the codger, facilitate the romance, and foment an eventual escape or marriage. In “The Barber of Seville,” as written by Beaumarchais, the story’s originator, Count Almaviva noticed Rosine in Paris and followed her to Madrid and to Seville to woo her and wed her. Rather than reveal himself directly, he assumes the identity of a poor music teacher named, Lindoro. All cultured young women of the late 18th century were supposed to be versed in singing and playing the piano (or harpsichord), so pretending to be a music teacher is a good dodge. While preparing his latest ploy to get Rosine’s attention, Almaviva, in the attire of Lindoro, is spied by Figaro, a former attendant of he count in Madrid. Figaro is a barber who uses the entrée he obtains by cutting hair, setting wounds, and pulling teeth to receive commissions to carry out a variety of other business, noble or nefarious but always for a handsome price. Almaviva enlists Figaro, already familiar with Bartolo, the ward who plans to marry Rosine, to help him in his campaign to rescue, abscond with, and marry the young heiress. Rosine has seen Lindoro enough to be in love with him and embrace his scheme to effect her escape and elope with her. Bartolo, meanwhile, is hastening his wedding date after hearing something about Rosine having a suitor. Bazile will be his confederate in making the wedding happen. Figaro must assist Almaviva in freeing and fleeing with Rosine. You see the potential for mayhem that a director and cast can turn into a good time. Wadsworth and company do more than that. They show “The Barber of Seville” as a comedy about people’s affections being at odds and emphasize various kinds of love and how much people overthink when they are pursuing romance. Almaviva and Figaro have an advantage because their intentions are the only ones that don’t waver. From the beginning, Almaviva declares he will liberate Rosine and take her to wife. Figaro knows Almaviva is a better match for Rosine than Bartolo, and Almaviva has a bigger and more bottomless purse, so his side is chosen. It is the portrayals of a few characters that sets the McCarter “Seville” apart. Derek Smith may be the first actor who has shown so many sides to Bartolo and who makes him at times sympathetic. While Smith is visibly older than Neal Bledsoe who plays Almaviva and Naomi O’Connell who plays Rosine, he retains handsomeness and vitality in middle age. He is not a stooped old man. He is robust figure at age 50 and has decent enough looks and sufficient physical vigor to make it plausible, and never repugnant, that he consider courtship and marriage to a young girl. Though Smith’s Bartolo takes the precaution of shutting his ward, Rosine, from the world, he is more of a strategist than a villain or curmudgeon. This Bartolo is a crafty and cunning man. As opposed to playing the fool, he is nobody’s fool. He has a debater’s nose for ferretting out and challenging flaws in logic. He retains dignity and mental agility when taxed by behavior that would frustrate some and have them flying into a rage. He can counter any statement or argument with one equally astute, and he seems as deft and as eligible as Almaviva in every way but youth. Smith’s Bartolo may make a compatible and amiable husband for Rosine. Except for one trait that Smith and Wadsworth make clear. He doesn’t love her romantically. That’s inherent in Beaumarchais’s play, you might say. But it isn’t. Smith and Wadsworth prove it isn’t. Part of the pleasure of watching McCarter’s “The Barber of Seville” is how much Smith changes the usual perception of Bartolo. In the middle-aged doctor’s mind, he is in love with his ward. Smith’s Bartolo is emotionally beyond wanting Rosine for the fortune she will acquire. He is sincerely enamored by her youth and grace. Even her disobedience to him, her protests about her limited freedom to walk about Seville, and her outright expressions of disdain, cannot cool his ardor. Smith’s Bartolo is hurt by his ward’s admonishments but because he is too afraid of losing her to another suitor before he can sway her heart, he maintains his vigilance and strictness about her liberty. Smith’s posture and expressions tell you this. 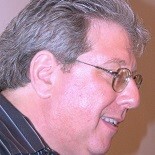 He elevates the intensity and depth of Bartolo’s role with every scene he plays. Bartolo, in ways, becomes more of a focus of Wadsworth’s “Barber of Seville” than the young lovers or Figaro. Smith’s art is in convincing you that Bartolo truly does love Rosine for understandable reasons, her youth, beauty, and cultivated grace. You can feel more for a man going to extremes to preserve his stake in Rosine’s affections you can for a silly old dotard who wants to ravish youth for vanity’s sake and get the lady’s gold as well. The genius of Wadsworth’s production, and the moment that turns the tide of sympathy more firmly in Almaviva’s direction than Bartolo’s, is a scene in which Rosine has become disenchanted with Lindoro, mistakenly thinking him to be treacherous or worse, a substitute for another suitor, and has a quiet, sincere, leveling moment with Bartolo during which she agrees to be his bride. Smith looks at O’Connell, and you see no sign of affection or ardor in his face. His expression is more one of surprise and businesslike dispatch, satisfaction for a task well concluded. But it contains no love. Bartolo has not tried to fool us or himself, but Smith has played Bartolo in way that makes you believe his love for Rosine is real and founded on legitimately romantic ground. When it turns out to be infatuation after all, we in the audience alone are free from delusion. Though we see Bartolo has no genuine passion in his eyes, Bartolo continues to think he feels love that will be miraculously requited. The moment is a coup de theatre and clearly demonstrates Smith’s skill as an actor and Wadsworth’s cunning in unfolding Beaumarchais’s play. The sequence I cite is one of several that sets McCarter’s “Barber of Seville” apart and turns the piece from being a familiar and beloved old chestnut to a textured comedy being shown from a fresh and refreshing perspective. Naomi O’Connell’s Rosine provides other examples. Rosine may be sheltered, but she is also educated and, before she arrives at Bartolo’s, well traveled. We know, for instance, that Almaviva has been tracking her across France and Spain. O’Connell’s Rosine is not a demure ingénue as attracted by intrigue as she is by a dashing young man that provides all kinds of contrast to her guardian and intended husband, Bartolo. She is a woman of intelligence and spirit, one that is not afraid to speak her mind or stand her ground, as limited as Bartolo permits that ground to be. O’Connell’s Rosine doesn’t enter into conspiracy with Almaviva only because he is good looking and she is desperate to escape from Bartolo’s clutches. Beaumarchais’s play and Wadsworth’s production cut deeper than that. Rosine sees qualities in Lindoro that trigger romance. As Neal Bledsoe plays him, Lindoro/Almaviva is not all moony flirtation and classic handsomeness. He is a playful wooer who has fun Rosine appreciates in addition to declaring his love and promising freedom from Bartolo. Bledsoe’s Almaviva is a guy who can woo with a tickle or cuff as well as a cuddle or kiss. In dance terms that don’t apply directly to the production, he can jitterbug as well as he can waltz. He is an attractive guy because he has variety and is more than an intense, feverish lover. You want him and Rosine to be together and have a life that includes fun and culture along with romance. Again, that desire seems to be part and parcel of “The Barber of Seville.” But it’s not. Naturally, Beaumarchais provides opportunity for all Smith, O’Connell, and Bledsoe accomplish, but it is Stephen Wadsworth who conceived and activated the production that makes all happen so clearly. The greatest virtue is Wadsworth and company keep “The Barber of Seville” amply comic and provide its audiences with a lot of laughs, some generated by sight gags or the actors’ expressions. You get heart and polish and a depth of character and plot development along with brisk and engaging comedy. This, folks, is what art is about. “The Barber of Seville” can survive on its own basic merits, but Wadsworth and his cast have added facets that vault it to a higher plane as literature and theater. You may have noticed that through McCarter bills its double does of Beaumarchais as ‘The Figaro Plays,’ I have not mentioned the scamp whose name figures into the title of both works and productions. That’s only because it is the portrayals of Bartolo, Almaviva, and Rosine that mark the significant difference between Wadsworth’s and other directors’ rendition of “The Barber of Seville.” I can add his view of Marcelline, a relatively minor character that becomes a figure of compassion on two levels, for her and by her, as played with serious mien by Jeanne Paulsen in Wadsworth’s production. Figaro, played by Adam Green, is a different kind of delight. Green, to put it simply, is adorable in his title role. While costume designer Camille Assaf has dressed all other characters, even Lindoro, with taste and quality that befits their stations, Green’s Figaro looks motley and slightly disheveled as if he spends so much time earning his way by doing multiple clients’ biddings he has not one second left to tend to his appearance or even comb his hair. Green is such a whirlwind as Figaro, his performance reminds you of the speed and meter of Rossini’s famous aria in which Figaro boasts about all he can do and his knack for being 30 places at once. He speaks as if he has a train to catch or as if he doesn’t want to give anyone the chance to interject or challenge anything he says. Green makes this tsunami of line delivery exhilarating and entertaining. You are certainly convinced this Figaro can accomplish anything and manage the most subtle or bombastic or arrangements with adroit aplomb. As an ally, an instigator, an architect, or a friend in need, Green’s Figaro can oblige in resourceful and entertaining fashion. Although never the center of any plot, he is in the middle of every plot. No one can do without Figaro. His sincerity is never questioned because his cleverness is so valuable and his plans are so shrewd and airtight. Besides, Green’s Figaro can outtalk anyone persuade him or her to believe or do anything. He is a master at gaining and inspiring confidence and a regular bulldog about getting paid from all sources for his help, even when he is really hindering his benefactor. Green makes all of Figaro’s talents clear in a litany about all he has done for people since arriving in Seville. His manner is always impish as if he was lost in commedia dell’arte while his castmates exude high style. Green brings additional energy and vigor to a stage that Wadsworth and company have made rife with it. He charms the audience as much as he inveigles various Sevillians and remains integral to all that happens even though Smith’s Bartolo takes the McCarter production’s primary focus. Cameron Folmar is also a comic treat as Dr. Bazile, the friend Bartolo relies upon to help him wed Rosine while he has the chance, and for a while, her consent. Figaro earns the money he extracts from numerous sources. Bazile extorts his fees from people to whom he’ll promise anything even when working at cross purposes, if they’ll pay him. Folmar is hilarious and agile in a scene in which Bazile catches purses of jingling coins from right and left as characters enlist his services. As with Smith’s Bartolo, Folmar’s Bazile is comic without being made to look like an idiot. On the contrary, Folmar gets to portray a man who is happy as a squirrel in a nut-packing plant because of all the money he can make with his conscienceless duplicity. Camille Assaf does more with costumes that differentiate Figaro from the rest of the characters. She shows a lot of wit in the details of the period clothing she provides. She and/or Wadsworth also set up an hilarious moment when Bazile arrives and realizes Almaviva, as Lindoro, is attired identically, lace collar to shoe buckle, to him. Charles Corcoran’s set proves versatile, especially when its upper floor shifts stage right to show more of Rosine’s quarters. “The Barber of Seville” runs through Sunday, May 4 at McCarter Theatre, University Place and College Street, in Princeton, N.J. Showtimes are staggered to allow for performances of “Seville’s” companion piece, “The Marriage of Figaro.” Shows are set for 7:30 p.m. Thursday, May 1, 8 p.m. Friday, April 25, 8 p.m. Saturday, April 19 and 26, 2 p.m. Saturday, April 12, 19, 26, and May 3, and 2 p.m. Sunday, April 20 and May 4. Tickets range from $87.50 to $20 and can be obtained by calling 609-258-2787 or going online to www.mccarter.org/ticketing. 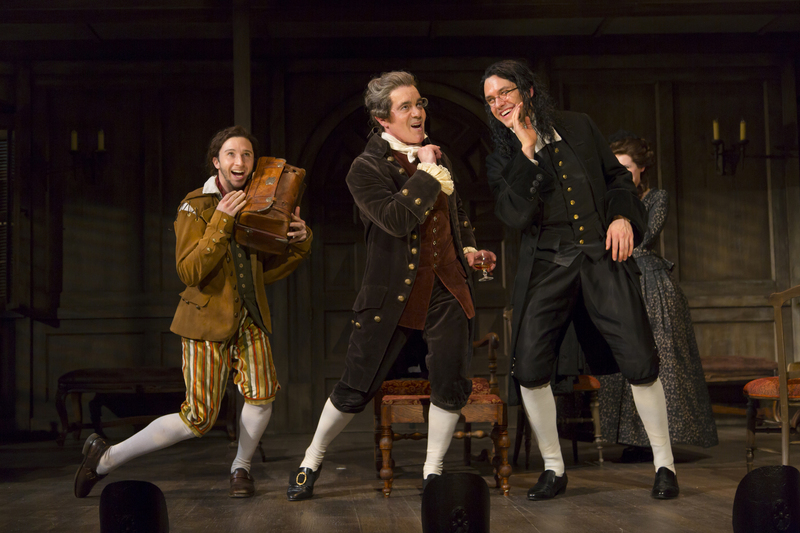 This entry was posted on April 10, 2014 by nzoren in Theater Reviews and tagged 18th Century, Adam Green, Cameron Folmar, Camille Assaf, Comedy, Derek Smith, Jeanne Paulsen, McCarter Theatre, Naomi O'Connell, Neal Bledsoe, Pierre Beaumarchais, Princeton, Repertory, Stephen Wadsworth, The Barber of Seville.